Never before, it seemed, had a prime minister been assailed by such a flurry of disasters in less than an hour on the conference podium. The prankster with the P45, the coughing fit that provoked feelings of pity and then, finally, the pathetic symbolism of the letters falling off the stage behind her. It culminated in the “f off”, as so many were quick to remark yesterday, and as an image it could hardly have been more telling. Labour should not be rubbing its hands with glee, however, at the scale of the Tories’ troubles. Yes, Theresa May’s excruciating speech helped to reveal publicly the sense of decay around her government but the presentational disasters which littered her speech yesterday should not be the legacy to be mulled over by the opposition. For Jeremy Corbyn and co the memory of May’s meltdown in Manchester should be the weak policy offering put forward when the Tory leader was supposed to be fighting for her political life. What she did come up with was either weak, wrong or borrowed from the opposition she affects to despise. For the latter, turn to the plan to freeze tuition fees and introduce an energy price cap. “The first of these was inspired by fear of Labour under Jeremy Corby, the second borrowed from Labour under Ed Miliband”, as Tory-leaning The Times put it today. The speech was a missed opportunity after seven years of falling real pay, remarked TUC general secretary Frances O’Grady. Or, as she put it pithily, “thin gruel”. That it was such is simply because May has no vision. Her policy offer is a shopping list of someone trying to get through to late 2019 rather than a plan to shape the country she serves. In that sense she is the polar opposite of Corbyn, who began his leadership with an idea of where he wanted to take the country and then set about finding the policies to carry it out, whether borne out of conviction, like anti-austerity measures;, national crises, such as housing and homelessness; or the one issue that overshadows virtually every part of British politics, in Brexit. Aside from May’s embarrassment at a dire speech, the key lessons for Labour should be twofold. First, that the PM’s scattergun approach to policymaking, and lifting of key Labour ideas, shows the arguments are shifting. The language of just three years past, when David Cameron and George Osborne would intone the mantra that there was no alternative more and more spending cuts, now seems like a lifetime ago. Corbyn has won a hearing for left-of-centre policies to reshape the more egregious inequalities of British life – such as the fact that successive generations of students should pay nothing, £1,000, £3,000 or £9,000 – or the jury is still out as to whether voters will back them in sufficient number. “We are now the political mainstream”, the Labour leader said during his own oration in Brighton, and he must seize on yesterday’s announcements in an attempt to prove it. Secondly, Corbyn and his team must now accept that imagery matters. When they started, and were assailed by a series of their own presentation problems – like the leader being uncomfortably “doorstepped” by broadcasters as he walked through Westminster one evening – they urged people to concentrate on substance. The manifesto plans started to flow but yesterday will have reinforced the idea that, if you want to be prime minister, sometimes the picture matters as much as the policy. Cameron was quite good at this – and Tony Blair was, of course, the master of the telling image or slogan. Corbyn is increasingly good with words when under pressure and yesterday’s debacle in Manchester showed the importance of a picture to crystallise what is going wrong in government – and life could be very different under Labour. So, although some may tempted to laugh at May’s coughing fit – and I count myself among them – it was an unfortunate side issue. The prime minister’s physical splutter is immaterial as compared to the choke which has afflicted her during her first year in office, with policies coughed up reluctantly only be watered down or abandoned days later. 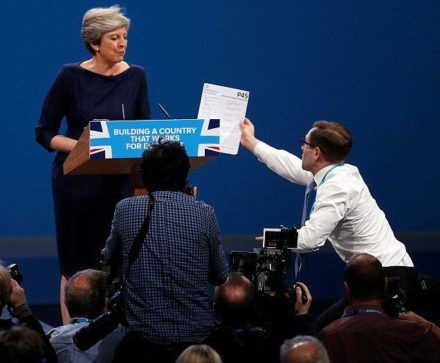 May’s real PR mistake yesterday was accepting the P45 brandished by juvenile prankster Lee Nelson when a more confident performer would have screwed up the piece of paper, tossed it over their shoulder and said something about the number of jobs created under the Tories (forgetting the in-work poverty that comes with many of them). May froze just as she did in the election. Corbyn has proved himself increasingly adept at the impromptu encounters which so troubled him at the start of his leadership. With Brexit talks hardly having got off the ground, the PM is not going anywhere yet – so Labour’s leader has ample opportunity to hammer home the message that May is weak, wounded and without any idea of where to take her government or her country.